Up for sale we have a 1934 Plymouth PF Coupe. 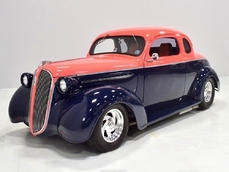 This is a rare opportunity to own Real Steel '34 Plymouth. 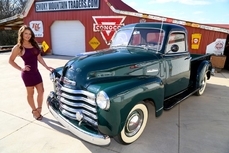 This is a steel car that has a steel body along with steel fenders and running boards. It's something you rarely get to see on Street Rods today and everything all appears to be rock solid. All the gaps and body lines are phenomenal on this car. It's covered in the Twilight Royal Plum paint that has been buffed and polished a gorgeous shine. 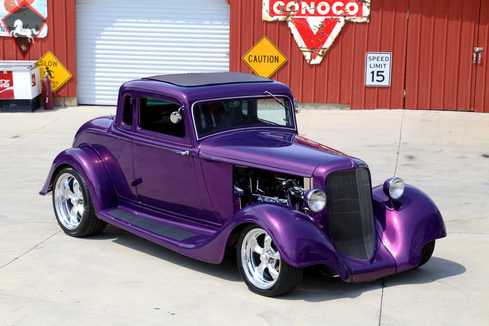 The paint scheme is accented by the custom pinstripe and Road Runner on the side. As you can see it has the factory doors as well with the outside hinges. The grill along with the rest of the Chrome and Stainless has all been polished to a beautiful shine as well. To finish off the look it's sitting on a set of 17” and 20” American Racing Wheels. Next, we will look at the interior of this '34. On the inside it's done in the Gray which an excellent accent to the exterior color combo. It flows perfectly and features the Bucket Seats. As you can see the seat covers along with the door panels, headliner and carpet are all in great condition. This Coupe does have Power Windows which are working along with A/C which is hidden behind the seats. The dash is painted body color and is accented by the Custom White Faced Gauges. Also, it has the tilt column that's painted body color and accented with the Wood Grain Grant GT Steering wheel. In the trunk it is also done in Gray and has the Custom panels with the 34 Plymouth Call Outs. Finally, we will get to the driveline of this Plymouth. Under the hood it features the 5.0L GM engine that's mated to the 350 Turbo Trans and 8.75 Ford Rear End. This small block chevy engine is dressed in the Polished valve covers and breather and has the heat shields for the manifolds. Along with the AC it also has Mustang II Rack and Pinon Power Steering and Power Brakes with Disc on the front and drums on the rear. To keep it cool it has the Aluminum Radiator and Electric fans. When you look under this Plymouth you're sure to be impressed as everything all appears to be rock solid and in excellent condition. The Frame has been notched and boxed to allow for the Mustang II Rack installation and they done a great job. All the floors along with the fenders and running boars appear to be in phenomenal condition as well. 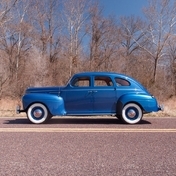 1934 Plymouth Deluxe is listed sold on ClassicDigest in Maryville by for $49995.